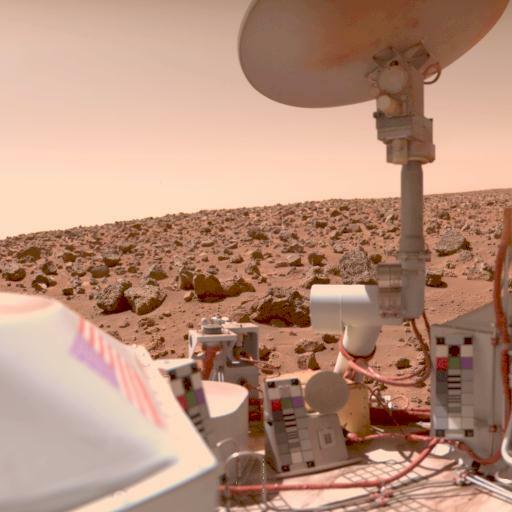 Viking color images of the martian surface suffer from a variety of uncertainties, in particular the relative brightness of the "red" and "blue" channels. 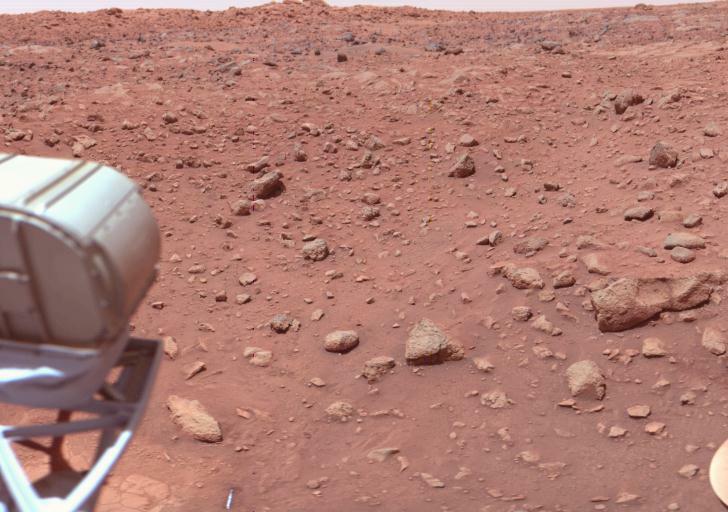 Early reconstructions of the Viking lander images tended to show "blue" sky, while later reconstructions, trying to account for out-of-band contributions in each filter, tended to show a "red" sky, and often an "orange" surface. Owing to calibration uncertainties, the exact reconstruction of Viking Lander color images remains more or less an art. Recognizing that even white portions of the spacecraft will appear slightly pink (or apricot), since sunlight reaching the surface is filtered through the atmosphere, which has a fairly high concentration of dust, and further recognizing that "orange" is not a particularly prevalent geologic "color," the colors in these reproductions tend more towards reddish-browns. Note that multiple images were acquired with the same ID number but through different color filters. Thus, for individual images (as opposed to the color composites shown below), the filter through which the image was acquired was also included in the ID number (Blue, Green, Red, IR1, IR2, IR3, and CLEAR). Viking lander mosaics were constructed from many separate camera events. Mosaics are mostly seamless since the camera geometry was fixed and the scene unchanging. The mosaics are composed of images acquired over a limited range of time-of- day and season. For this page, only one "time of day" is presented for each lander, but both camera's views are included for those who are interested in stereoscopic viewing. Only JPEG versions of the images are included, owing to the size of the images. Note: L1.C1.AM.Q3+Q4 has been damaged in tranmission to us. We are trying to see if we can get another copy of it. Jones, K. L., M. Henshaw, C. McMenomy, A. Robles, P. C. Scribner, S. D. Wall, and J. W. Wilson (1981) Viking lander imaging investigation during extended and continuation automatic mission: Vol. I - Lander 1 picture catalog of Experiment Data Record. NASA Reference Publication 1068, vol. I, 648 pp. Jones, K. L., M. Henshaw, C. McMenomy, A. Robles, P. C. Scribner, S. D. Wall, and J. W. Wilson (1981) Viking lander imaging investigation during extended and continuation automatic mission: Vol. II - Lander 2 picture catalog of Experiment Data Record. NASA Reference Publication 1068, vol. II, 557 pp. Libes, S., Jr. (1982) Viking lander atlas of Mars. NASA Contractor Report 3568, 289 pp. Tucker, R. B. (1978) Viking lander imaging investigation: Picture catalog of primary mission Experiment Data Record. NASA Reference Publication 1007, 559 pp.